There is no such thing as "white supremacy"
The phrase "white supremacy" has been used repeatedly by so-called white supremacists themselves, those who oppose them, the media and the authorities, including politicians -- so much so that the phrase has been legitimized and many people have internalized the idea that a group of people are somehow superior to others by virtue of their race or skin color. That is not true. The idea of "white supremacy" was thrust to the limelight after a White nationalist rally in Charlottesville ended in deadly violence. White nationalists and counterprotesters clashed in the city of Charlottesville, Virginia in what The New York Times described as "one of the bloodiest fights to date" over the removal of Confederate monuments across the South. One of the White nationalists plowed a car into a crowd killing a 34-year-old woman and injuring at least 19 people. Some 34 others were injured in skirmishes, according to the New York Times. The governor of Virginia declared a state of emergency and the National Guard was deployed to help the police restore law and order. A man identified as James Alex Fields Jr. was arrested and charged in relation to the car attack. CNN reports that the suspect holds extreme views, according to his former teacher. The teacher who teaches Social Studies at Randall K. Cooper High School told CNN that the suspect held "outlandish, very radical beliefs" with a "fondness for Adolf Hitler". The incident was followed by a mainstream media and social media frenzy -- with almost everyone referring to "white supremacy" as though it were a legitimate concept grounded on facts. There is no such thing as white supremacy. Just like the jihadist statehood idea of so-called Islamic State, the idea of white supremacy is an illusion based on an inhuman desire by some to control and subjugate others. The difference between the idea of a jihadist Islamic State and white supremacy lies in the fact that there seems to be consensus in the West that the former is an illusion, hence it is commonly referred to as "so-called Islamic State" by western news outlets while the latter is fully legitimized and presented as fact. More than 120 British MPs reportedly signed a letter urging the BBC to stop referring to jihadist group ISS as "Islamic State" because, according to the MPs, the terrorist group is neither Islamic nor a state. The BBC went on to review its use of "Islamic State". Same logic, in my view, applies to so-called white supremacy. Those who subscribe to the racist idea of "white supremacy" are, in my view, white but they are not supreme. The idea of white supremacy is a social construct designed to push a racist agenda that white people are superior by virtue of the color of their skin. A more realistic concept is White privilege, which was well-demonstrated in the aftermath of the Charlottesville car attack. Donald Trump, president of the United States, refrained from condemning the so-called white supremacists - understandably so since they make up his base and helped get him elected based on the racially divisive presidential campaign he ran. Condemning the group would be political suicide for the beleaguered US president. Had the attacker been non-white, Mexican, an immigrant or a Muslim rhetoric from the White House would have been stronger and louder. 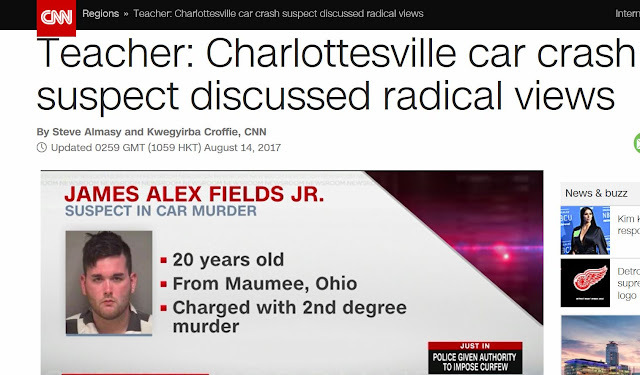 After ramming his car into a crowd in a manner reminiscent of the London Bridge attack James Alex Fields Jr. was, according to The New York Times, charged with second-degree murder, three counts of malicious wounding and failing to stop at the scene of a crash. That is white privilege not white "supremacy". Someone who looks different and affiliated to a different extremist group would have been labelled "radicalized" and had law books thrown at him with charges including terrorism and first-degree murder. Referring to a bunch of racists as "white supremacists" legitimizes the uninformed, racist ideology on which such groups are founded. Referring to them as "so-called white supremacists" is more like it because those who identify themselves as such are not supreme -- they are privileged at most.